Unfortunately, one of the occupational hazards of being a pitcher is the arm pain that comes with repetitively throwing a ball as hard as possible. If a pitcher throws long enough, arm pain and soreness are inevitable. However, there are steps a pitcher can take to treat the pain and make it less uncomfortable. Proactively prevent arm pain. It is absolutely vital for a pitcher to stretch muscles and get blood flowing to the arms before even touching a baseball. A standard stretch routine would include arm circles and arm swings, and stretches for the forearms, biceps and triceps. Increasing blood flow to the arm will allow a pitcher to not only throw with less pain, but also throw with more effectiveness. The R.I.C.E method -- which stands for Rest, Ice, Compression and Elevation -- is a very effective way of treating arm pain. Obviously, it is important for a pitcher to get enough rest so the arm can recover from the stress of repetitive pitching. A generally accepted rule is resting approximately one hour for every pitch thrown. So, if a pitcher throws 70 pitches, three days of rest should suffice. Icing the arm and placing compression on the elbow and shoulder are easy ways to reduce swelling. Fifteen minutes with ice on and 15 minutes with ice off is sufficient. If possible, elevate the arm in order to reduce swelling. Taking ibuprofen or acetaminophen in limited doses can help alleviate arm pain. It's important to remember that pain medication should only be taken after throwing and not before. 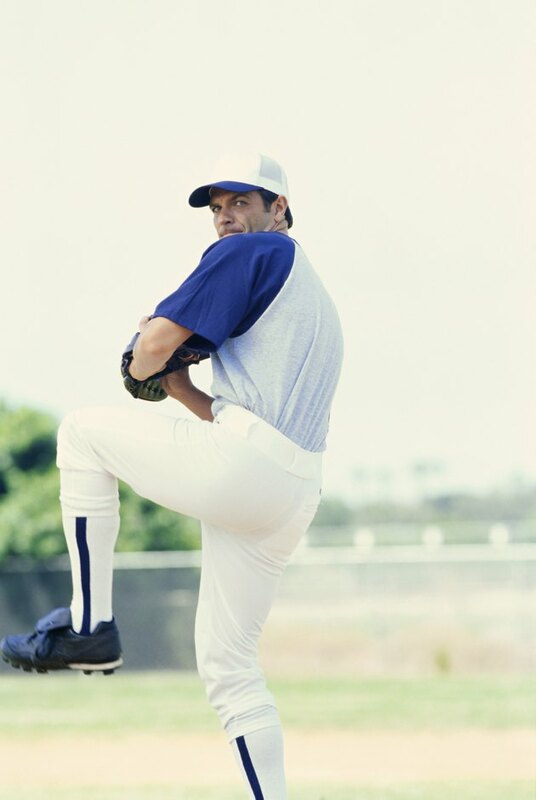 If pain sensations in the arm are reduced by the medication while pitching, then he might have a harder time noticing an injury or another physical sign indicating he should stop. Arm soreness is to be expected after pitching and soreness itself is not a sign that anything is functionally wrong with a pitcher's arm. However, a pitcher should know the difference between routine soreness and severe pain. If a pitcher ever feels numbness in his fingers, a sharp pain in the elbow or shoulder at any point during the throwing motion or pain he's never felt before, he should immediately stop throwing. If the symptoms persist even after employing the RICE method, then a trip to an orthopedist may be required to rule out any major injuries.